But I Don’t Have Anything to Write About . . . . | I Teach. What's Your Superpower? But I Don’t Have Anything to Write About . . . . 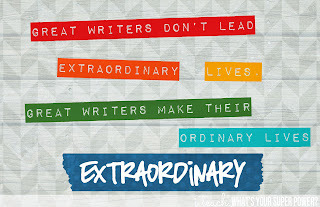 The favorite phrase of every reluctant writer. 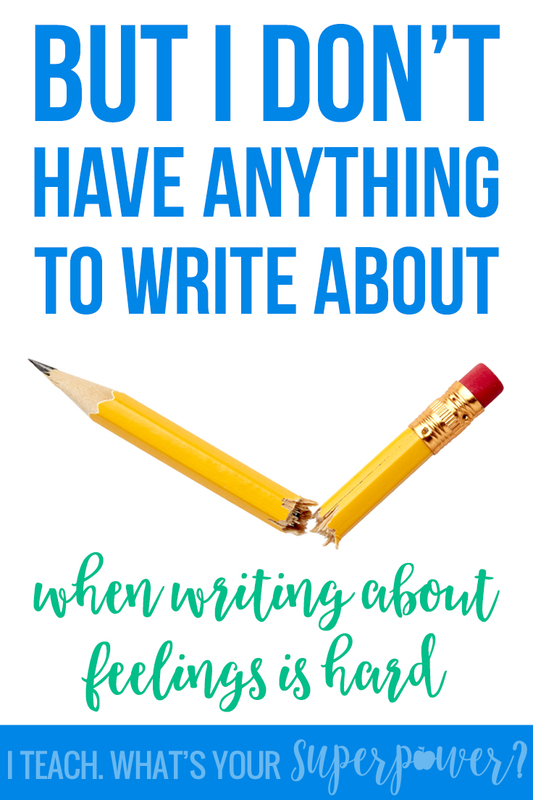 Before you go all in with your writing lessons, it’s a good idea to firmly convince everyone that they do have something to write about. 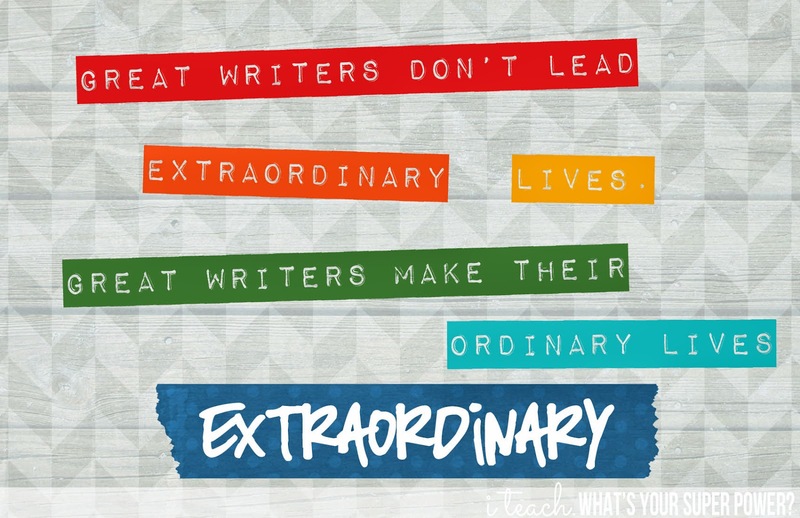 Because otherwise, you’re kiddos that are uncomfortable with writing will cling to this phrase like a life raft in a storm. First things first, I promised this little group of third graders that we would not be writing a story today. We talked about how hard it can be to come up with a story idea because you don’t go to the beach or Disney World every day. But, it’s okay because that’s not where good stories come from. I then told them two very boring stories-one from a trip to the beach and one from a trip to Disney World. We talked about what was wrong with these stories: boring, just a list of what you did, nothing happened, etc. I then retold a story from Disney World. This time I chose a memory I had strong feelings about-the time we got soaked on Splash Mountain. In February. I told them if they’re stuck for a story idea, stop trying to think of ideas and think about feelings instead. We all have feelings, and that’s where good stories come from anyway. First, I made a chart with four emotions. I brainstormed a memory for each feeling. 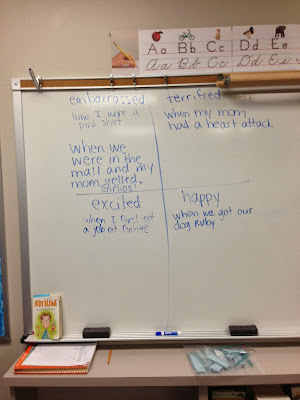 Before I sent them off to do this in their journals, we created a list of emotions. And guess what’s waiting for them the next time they can’t think of anything to write? 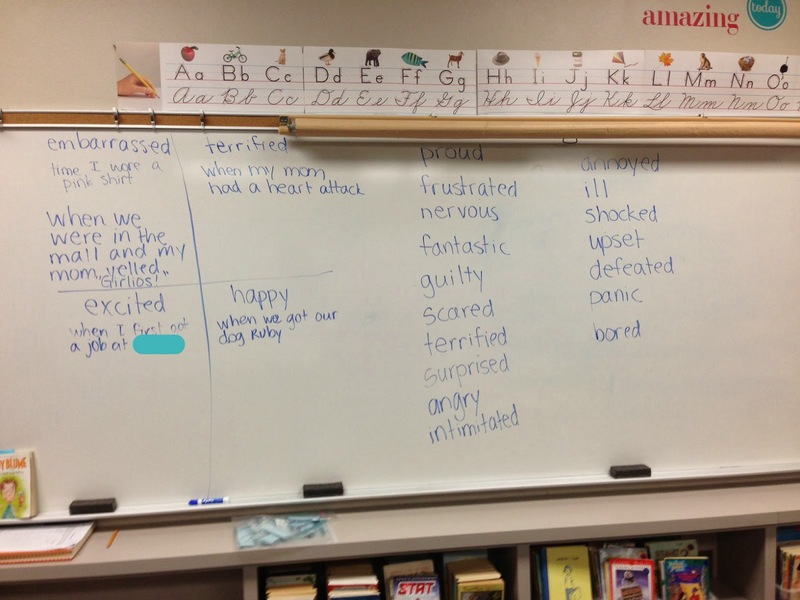 I did this same lesson with another class a few days later, and a student insisted that he had never had any feelings. Hmmm. I told him to pretend. Okay-maybe he was lazy. Maybe he didn’t feel like doing the work. Maybe he was trying to test the waters. But maybe there is a little bit of truth there. Many of our reluctant writers are not experienced with being reflective. So telling these kiddos to do something they’re uncomfortable with (writing) about something there not comfortable with (internal reflection) is not going to get your very far. 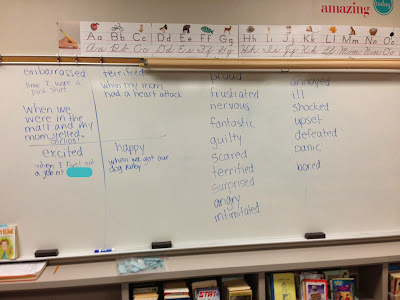 Telling them to pretend may seem a little off track when writing personal narratives. I get it. However, just the act of writing about someone experiencing an emotion will help them become more self aware and give them practice writing. It may not be where you want them to be right now, but the only way to get there is to start writing. You can use my $1.50 poster trick on this one. Download it, stick it on a flash drive, take it to Office Max, ask them to print it on 11x17 glossy card stock. Boom. For $1.50, you’ve got a poster. The watermark is not on the download. But apparently people like to steal pictures off Pinterest and redirect them to their hairstyle blogs. And no matter how many times you report this to Pinterest, they don’t care. 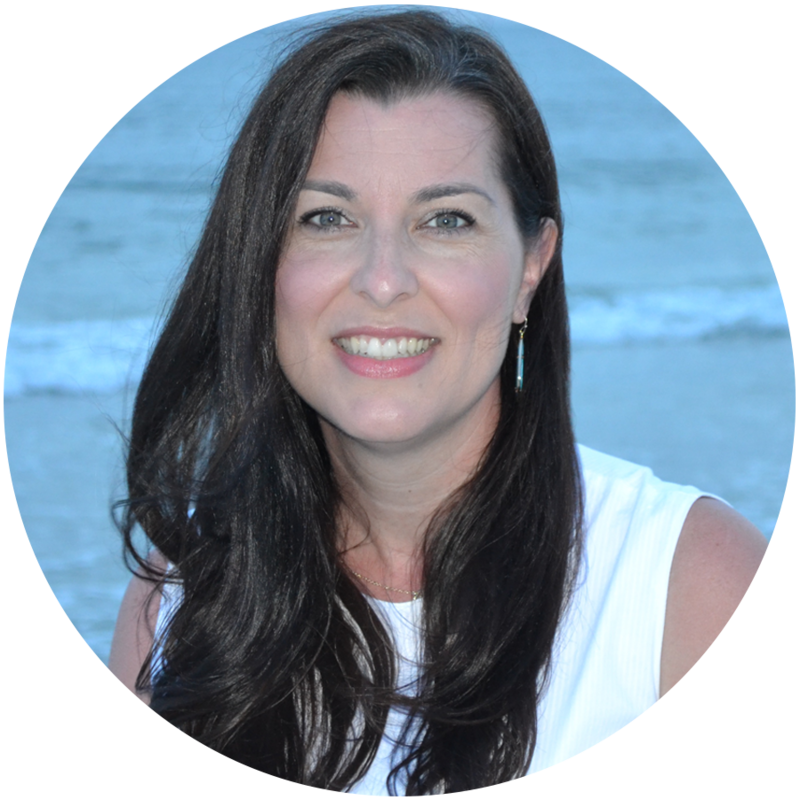 Do you have any tips for getting started with reluctant writers? What a fantastic post! I cannot STAND the 'diary' type of writing. Especially when the title is always like, "The Most Exciting Day of My Life" and then it starts off "I woke up. I got dressed and went downstairs. I ate toast with jelly. Then we drove to Disneyland. 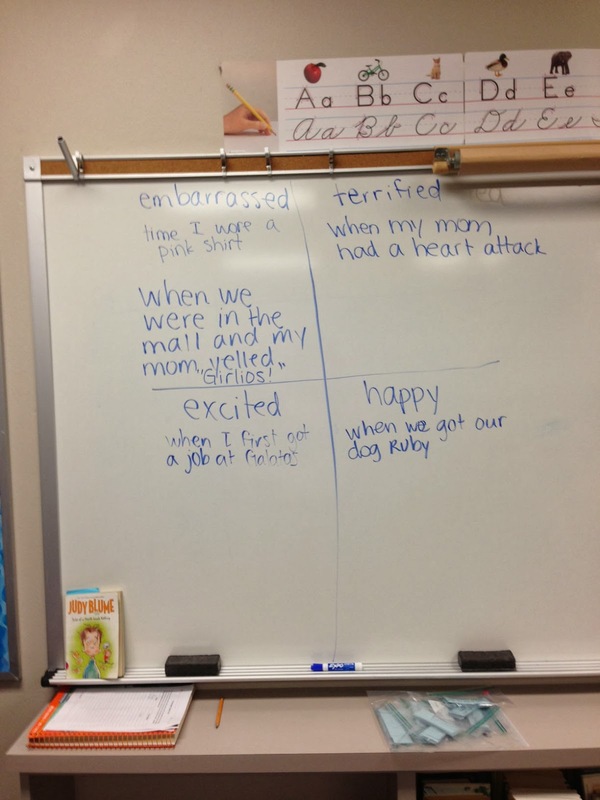 I..."
We are doing your emotion chart next week! Thanks for the great tip.